This modestly-priced clock from Seldec Publishing is ideal for people who want to switch to 24 hour timekeeping one step at a time. 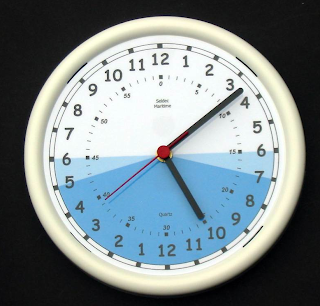 With 12 at the top, times in the middle part of the working day (09:00 to 15:00) look similar to the equivalents on more conventional 12 hour clocks, and the blue shading tells you that it’s evening or night-time without you having to use numbers bigger than 12. 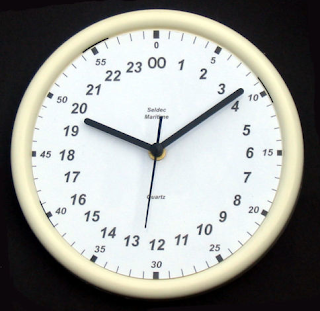 For these and other 24 hour clocks, visit Seldec Publishing. The first example above has noon at the top, the second has noon at the bottom, so when switching from the first to the second you have to retrain your brain all over.There are plenty of 24hr analogue clocks which have the hours numbered zero to 23 or 1 to 24 but have 12 noon at the top.These have the day neatly divided in four parts:morning / afternoonnight / eveningGreat for shiftworkers.